This week we went on what has become affectionately known by those at Culloden as the ‘Jacobite Jaunt’. Every year as a thank you to our volunteers we try to organise a day out where we can explore new places of Jacobite interest and also have a bit of fun. So this Thursday a bunch of us headed out on the latest jaunt to see what we could find. Expertly led by our fearless learning officer Jon we started off by heading into town to Inverness Museum. Here we were given a great tour of the site and taken back stage to see some of the artefacts in storage. This included a waistcoat supposedly worn by Prince Charles Edward Stuart which was gorgeous and letters and documents from the 18th Century. We also got the chance to feel the difference between older tartan compared to modern day. Thanks to the setting agents used now current day tartan is soft and pliable but back in the 18th Century it was much stiffer and harder to move. Not something you usually consider and great to be able to get a chance to understand the difference. It’s safe to say we were all rather pleased our costumes are softer than they were back in the day. We also saw a beautiful tartan wedding dress which is on display in the museum. The tartan would have been hidden away after the Battle of Culloden when tartan was banned and then once the Proscription Act was lifted it was remade into a gorgeous dress which is still worn for weddings by the family to this day. 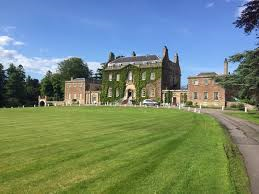 Next it was off to Culloden House Hotel. I have to say we felt very posh sitting enjoying a cup of coffee in the drawing room and we were treated as we were shown the original wall of the building which was hidden behind the ‘door to nowhere’. Refreshed we then went out to the walled garden and we managed to see the bench which the ‘Ladies of Lallybroch’ donated on behalf of Diana Gabaldon. She has stayed at the hotel and her Outlander series of books has certainly brought many visitors to the area. From here it was a bit of a drive through to Elgin. Here we had a look around Elgin Museum which again houses some Jacobite artefacts and took a walk to see Thunderton House which is said to have been used as a hiding place for Prince Charles before Culloden. Unfortunately, then it was time to make our way back to Culloden but, we made sure to take the scenic route to catch a few more treasures. 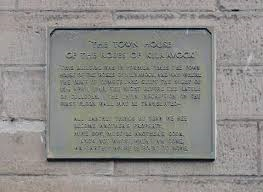 Driving through Nairn we paused to see the plaque commemorating the spot where the Duke of Cumberland stayed the night before the Battle of Culloden. We also drove past the battlefields of Auldearn where the Covenanters fought in 1645. Today you can stop at Boath Doocot, once part of a twelfth century castle, which has views across the fields where the fighting took place. Finally as we got nearer to Culloden we turned off and Jon took us on a rather narrow road to show us a ravine. At first it didn’t look that special but he explained that this was one of the spots where the Jacobite army had thought about fighting with the steep grassy slopes at the side ideal for slowly down the Government army. What if questions arose but who knows what would have happened had the Jacobite army fought there or over the River Nairn. Overall it was a great day with chance for us all to unwind and do a bit of team bonding whilst getting a great opportunity to explore more Jacobite history so that we can pass it along to all of you when you visit.